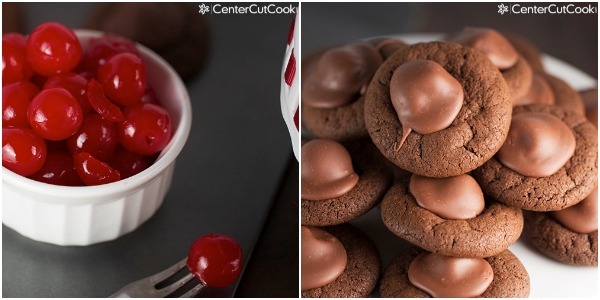 Chocolate Covered Cherries were the inspiration for this simple and easy recipe for Chocolate Covered Cherry Cookies! These will soon be on the list of Christmas Cookie Recipes that you make year after year! I’ve always wanted to try a recipe for chocolate covered cherries, but the idea of it sounded so complicated to me! I’m not quite sure why either, because I’m sure it’s really quite simple to make. While I may be intimidated of making candy, I am definitely not intimidated of making cookies so I thought to myself, why not try making a cookie that incorporates everything I love about the classic chocolate covered cherry? And that’s how these tasty little Chocolate Covered Cherry Cookies came to be! Just look at these beauties! Do they not look amazing? 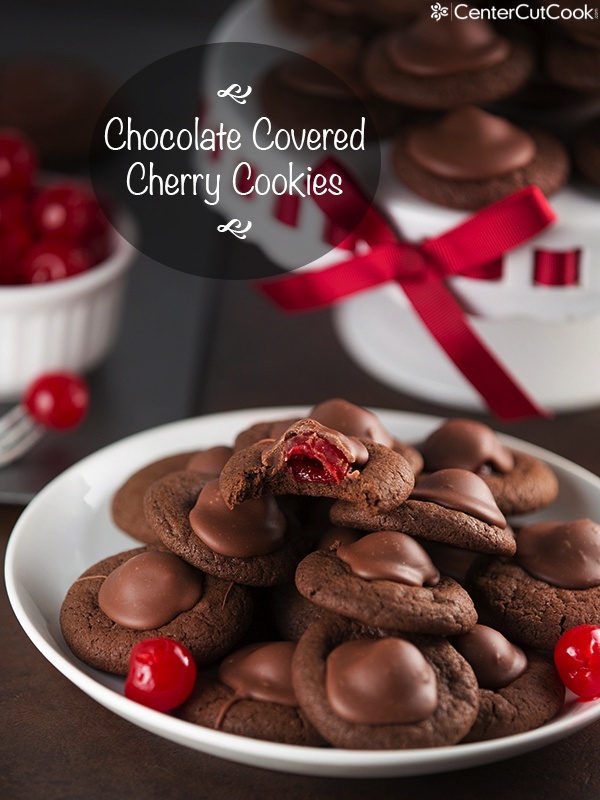 If you like chocolate covered cherries like I do, you are going to adore these cookies. And while they are not difficult to make, they do take a little bit of extra effort and time. Let me assure you, however, that these cookies are worth every little bit of extra time it might take! As I was making these for the first time, I tried two different methods for adding the chocolate frosting. First I tried adding the chocolate frosting before the cookies baked. They didn’t turn out quite like i had expected, so I tried adding it after they came out of the oven, and the result was perfect! The cookie portion is almost brownie like which i just love! Whether you are making these for a Christmas or holiday party, or for any time of the year, they will be a hit! In a large bowl, sift together flour, cocoa powder, baking powder, baking soda and salt. Set aside. With your mixer, cream together butter and sugar until light and fluffy, about 2-3 minutes. Add in egg and vanilla and mix to combine. Slowly add in dry mixture and mix until everything is well combined. Use paper towels to pat the cherries, removing any excess liquid. Use 1 tablespoon of cookie dough and use your hands to roll them into balls. Arrange on baking sheets, about 2 inches apart. Use your thumb to gently create an indentation in the center of the cookie. 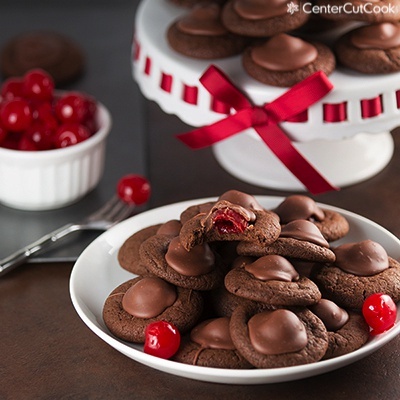 Place a Maraschino cherry in the center of each cookie. Bake for 10-12 minutes, or until cookies are just set. As the cookies are baking, create the chocolate topping. In a large bowl combine 1 cup milk chocolate chips with 1/2 cup sweetened condensed milk and 2 tablespoons cherry juice. Microwave at 50% power for about 1 minute, then stir. Then microwave 20 seconds at a time until the chocolate is melted and well combined, stirring between each interval. When the cookies are done baking, carefully transfer them to cooling racks to cool for a few minutes. Place the chocolate mixture in a piping bag, or a Ziplock bag. Snip the corner and pipe the chocolate mixture over the center of each cookie. Allow the chocolate to firm up which will take about 15-20 minutes. You’ll get 2.5-3 dozen cookies from one batch.